Background: The Natural Orifice Transgastric Cholecystectomy is a method in development. This study proposes the hybrid approach, transluminal and laparoscopic, showing the advantages of the technique. Methods: Non-survival procedures were conducted in pigs(n=15) using a transgastric approach. The procedure started with a puncture in the umbilical scar to create a CO2 pneumoperitoneum through the Veress needle. The gastroscope was introduced in the abdominal cavity, after opening the anterior gastric wall with dissection(scissor) and enlargement the wall with papillotome/balloon. In the final model, a device was put to isolate the scope from the alimentary canal, being avoided larger chemical and biological contamination. A 5mm trocar is placed in the umbilical under endoscopic vision. With a multibite biopsy forceps placed through the scope we presented the gallbladder and a laparoscopic grasper was introduced into the cavity to provide traction and exposure the artery and cystic duct. They were identified and dissected with needle-knife, hot biopsy forceps and endoscopic forceps. Endoclips were used to close the duct and the artery. The gallbladder has been dissected from the liver with the same instruments. The extraction of the gallbladder was made by traction. The gastric opening is closed with suture performed with anchors to keep the thread in a suitable place. In few cases an omentum patch was used(clips). 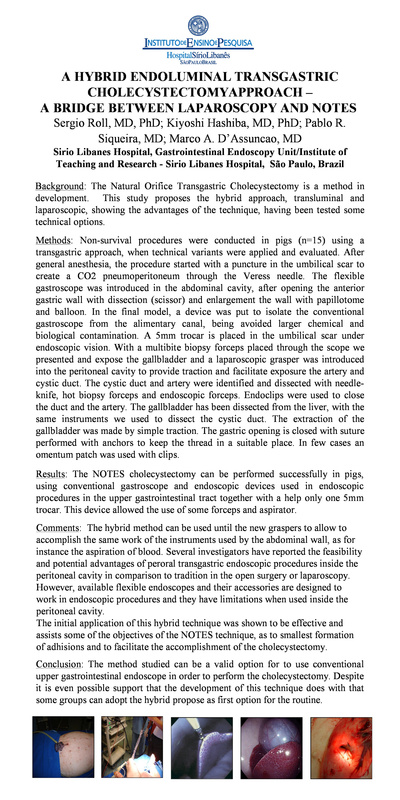 Results: NOTES cholecystectomy can be performed successfully in pigs, using conventional scope and endoscopic devices used in endoscopic procedures in the upper gastrointestinal tract together with a one 5mm trocar. This device allowed the use of some forceps and aspirator. Comments: The hybrid method can be used until the new graspers to allow to accomplish the same work of the instruments used by the abdominal wall (ex.aspiration of blood). Several investigators have reported the advantages of peroral transgastric technic. However, available flexible scopes and their accessories are designed to work in endoscopic procedures and they have limitations when used inside the peritoneal cavity. The initial application of this hybrid technique was shown to be effective and assists some objectives of the NOTES technique. Conclusion: The method studied can be a valid option for to use conventional upper gastroscope in order to perform the cholecystectomy. Despite it is even possible support that the development of this technique does with that some groups can adopt the hybrid propose as first option for the routine.